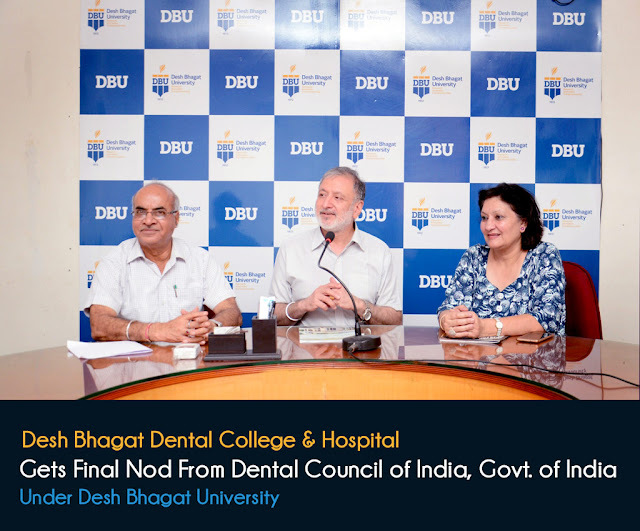 Desh Bhagat Dental College and Hospital, Sri Muktsar Sahib, which was running in Sri Muktsar Sahib since 2000 got final nod from Dental Council of India (DCI)/ Govt of India (GOI) in the new campus at village Saunti, Amloh Road, Mandi Gobindgarh in the campus of Desh Bhagat University, vide letter no.V.12025/17/2017-DE, dated 18.08.2017. 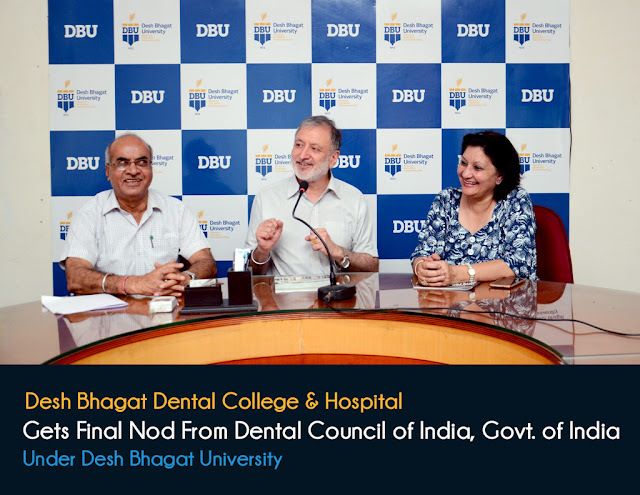 The college which is recognized for 100 BDS seats and is running MDS programmes in 4 specialties Periodontology, Conservative Dentistry & Endodontics, Orthodontics & Dentofacial Orthopedics, and Prosthodontics and Crown and Bridge got NOC from Punjab State Govt in December to shift to village Saunti, Amloh Road, Mandi Gobindgarh and started the shifting process soon afterwards and was functional from Feb, 2017 at changed venue. 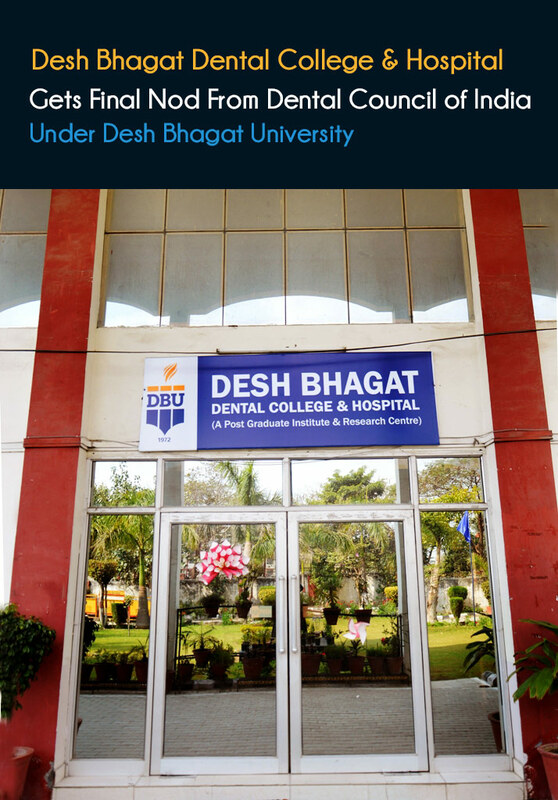 Desh Bhagat University granted the affiliation to the dental college and made it a constituent of Desh Bhagat University. DCI after going into detailed scrutiny since March, 2017 and inspection in July, 2017, recommended for the approval of the campus in Desh Bhagat University after satisfying itself in terms of land, building, infrastructure, faculty and facilities as per the DCI norms and standards. The Govt of India, Ministry of Health and Family welfare, on the recommendations of DCI granted approval for the campus at Mandi Gobindgarh under Desh Bhagat University on 18/08/2017 vide letter no. V.12025/17/2017-DE, dated 18.08.2017. Speaking on the occasion Dr. Rajeev Bali, the Principal, said we are going for 100 BDS admissions for academic session 2017-18 through the centralized counselling as per Govt of India public notice for counselling/admissions. The Vice Chancellor of DBU Dr. Virinder Singh congratulated the Chancellor Dr. Zora Singh, Pro Chancellor Mrs. Tejinder Kaur and Vice President Mr. Sandeep Singh for the hard work done by them despite many hurdles. He said it is the gift to the holy land of village Saunti (Fatehgarh Sahib) which has the pious touch of Sri Guru Hargobind Sahib Ji, the sixth master of Sikhs.